TENS Therapy can be a drug free avenue to find pain relief. Upon consulting with a Physician or physical therapist, a TENS treatment regimen is easy to begin thanks to OTC Wholesale. Every device you need to get started is available including battery chargers, batteries, adapters, skin barrier wipes, treatment lotions, prep lotions, and replacement wires. As such, it is possible to find pain relief from the comfort of your own home. Transcutaneous electrical nerve stimulation (TENS) uses a small device to jolt the body with an electric signal that causes the brain to block pain receptors while also promoting the production of endorphins. Many uses find pain relief from various medical issues such as muscle and joint problems. Those with chronic illnesses such as fibromyalgia and osteoarthritis also often can receive benefits from TENS treatment. Silver electrodes provide a better experience than carbon electrodes due to their ability to spread the surface area of the treatment. This forms a much better connection between the device and the body. As such, OTC Wholesale provides the absolute best prices on Silver Electrodes. Electrodes are available with both Mesh and Foam backings. Foam backings work well if you are combining TENS treatment with hot and cold treatments whereas mesh backings are more flexible to work with. 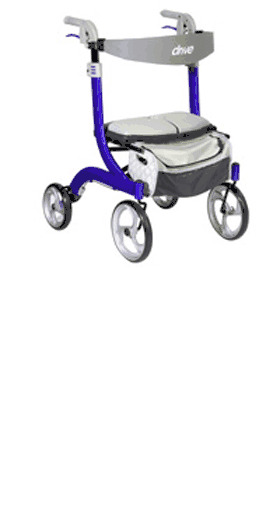 OTC Wholesale offers the best quality brands and products and low prices. Whatever you need you will be able to find here. Silver Electrodes refer to carbon electrodes that include a thin layer of silver between the pad and the backing where the actual wire connection is made. This silver forms a better connection between the wire lead and the electrode, and distributes the electricity more uniformly across the pad. Silver Electrodes are slightly more expensive to produce, but they are substantially more effective at delivering the electrode stimulation treatment to the affected site. Results of a dispersion test on Silver Electrodes vs. Carbon Electrodes will show a much greater dispersion area with more intensity on the silver coated electrode. Our silver electrodes also use copper lead wires with special heads that help promote greater dispersion and prevent the wire from pulling out. You simply cannot buy a better TENS Unit Electrode! 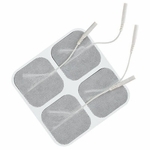 Whether you are using a TENS unit, Muscle Stimulator, Interferential unit or a Galvanic unit, you will get a lot more out of it using silver coated electrodes. Many clinical therapists recommend foam backed electrodes when the treatment is combining hot and cold therapies with electrode stimulation. 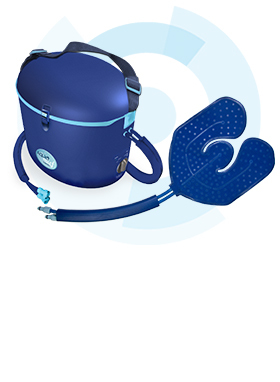 The foam backing repels moisture created by the treatment and adds insulation between the external therapy and the electrode pad. Many of our customers prefer the foam backed electrodes for their smooth touch and flexibility, though they are somewhat more high profile than the mesh backing. 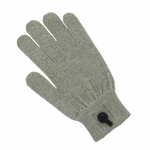 Mesh or cloth backing is generally slightly more flexible than their foam backed counterparts. We select all of our electrodes from reputable suppliers and most of our electrodes feature a brand name or an American made gel for maximum reusability. This adds a slightly higher cost to the manufacturing process and to the price of the electrodes. There are less expensive electrodes available using a foreign made adhesive and we are currently testing their reusability to make sure it meets our standards. Some of our economy electrodes use a foreign made gel and feedback has been very good. 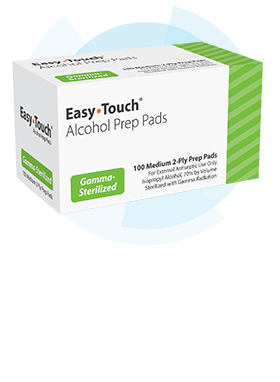 Transcutaneous Electrical Nerve Stimulation (TENS) is a non-invasive, drug free method of controlling pain. 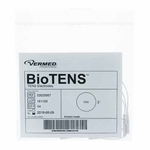 TENS Units use tiny electrical impulses sent through the skin to stimulate the nerves and modify pain perception. 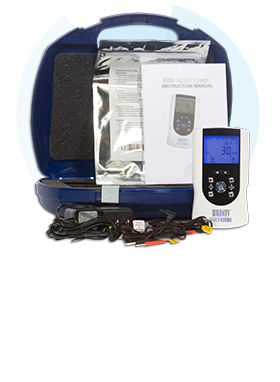 The main use of a TENS machine is for pain relief, particularly in the case of chronic pain. It is most often used for joint or muscle pain that won't go away, but can also be used to help treat nerve problems without resorting to drugs. It isn't uniformly effective. Different people will have different results. For some, TENS electrical pulses interrupt the pain signals so effectively that they are literally without pain. Others may experience different levels of relief. However, in most cases, there will be some degree of relief from chronic pain. The TENS Unit overrides the pain signal by "tricking" the brain into thinking there is no pain. TENS Units use nerve stimulation to provide relief from back pain, foot pain, shoulder pain, neck pain and virtually any other acute or chronic pain. Two small electrodes are placed on either side of the area where the pain originates. The higher frequencies tend to block the pain signals, while much lower frequencies will stimulate the body to produce endorphins which naturally reduce pain. When the TENS Unit overrides the pain signal, it "tricks" the brain into thinking there is no pain. TENS Units use nerve stimulation to provide relief from back pain, foot pain, shoulder pain, neck pain and virtually any other acute or chronic pain.